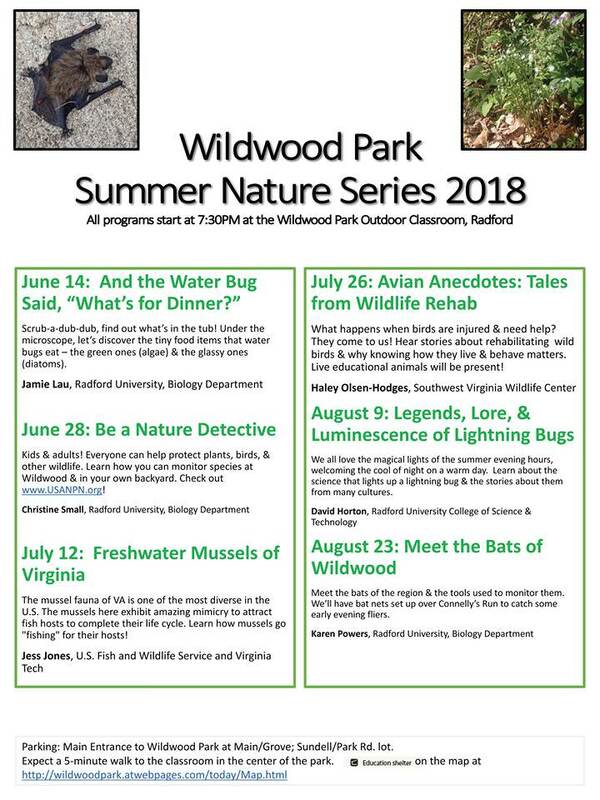 2018 Wildwood Park Summer Nature Series: "Meet the Bats of Wildwood "
The 2018 Wildwood Park Summer Nature Series concludes with the free program "Meet the Bats of Wildwood" on Thursday, August 23, 2018 at Wildwood Park in Radford, VA.
Meet the bats of the region and the tools used to monitor them. We'll have bat nets set up over Connelly's Run to catch some early evening fliers. The program will be led by Karen Powers from the Radford University Biology Department. Join us in a marvelous natural setting at twilight for these free bi-weekly, family-friendly multi-media presentations by local naturalists starting in June and continuing through August. Park at the Main Entrance to Wildwood Park at Main / Grove or the Sundell / Park Road lot. It is a 5-minute walk to the classroom in the center of the park. In case of rain, the lecture will move to the Radford Recreation Center. An announcement will be made by 6:00 pm the day of the lecture. To view the event flyer, visit: https://i.imgur.com/MxXfy0D.jpg. For more information, visit: http://wildwoodpark.atwebpages.com/OC_LectureSeries_18/LectureSeriesSchedule18.html or https://www.facebook.com/wildwoodlectures/ or contact Matt Close at mclose2@radford.edu or Karen Powers at kpowers4@radford.edu.